Billy Graham in Quotes is a 2011 book compiled by Franklin Graham and Donna Lee Toney. It does what it says on the cover. The vast majority of these quotes are taken from Billy Graham’s many books. The quotes are arranged topically: “Billy Graham on Abortion,” “…on Addiction,” “…on Age,” America, angels, anger, anxiety, and so forth, all the way down to “Billy Graham on Young People.” There are about a hundred topics, with an average of three or four pages devoted to each. The quotes are centered on the page; that takes some getting used to. This book is nearly 400 pages. While this is perfectly understandable given Graham’s sixty-plus years of ministry and authorship, it’s unusually large for a book of this sort. But it should come as little surprise that the book can get awfully repetitive very quickly. Not that there are any bad or worthless quotes, but there’s a great deal of overlap; quantity over quality, as it were. The book could have been cut by a quarter or more without any real damage being done. Graham is almost never witty or clever; his quotes are nearly always simple statements of biblical truth. This isn’t a criticism by any means; it’s just that he’s hardly quotable in the way Ben Franklin or Mark Twain is. This has a further hampering effect on readability, particularly as many of these quotes would really have benefitted from some context. It’s also hard for me to imagine much application for this book. It could be used as a topical reference for those with a comprehensive library of Graham’s books, I suppose, or as good bathroom reading on its own. 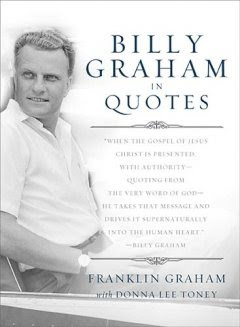 I affirm the vast majority of what Graham says in his quotes; I just don’t see much need for this particular book. I’d imagine most readers would be better off spending the time reading Graham’s actual books (or the Bible).